I have a standard format for patchnames: 1234-99.project.brief-description.patch, where 1234 is the issue number and 99 is the (expected) comment number. However, it involves two copy-pastes: one for the issue number, taken from my browser, and one for the project name, taken from my command line prompt. Out of the components of the patch name, the issue number and description can be deduced from the current git branch, and the project from the current folder. For the comment number, a bit more work is needed: but drupal.org now has a public API, so a simple REST request to that gives us data about the issue node including the comment count. So far, so good: we can generate the filename for a new patch. But really, the script should take care of doing the diff too. That's actually the trickiest part: figuring out which branch to diff against. It requires a bit of git branch wizardry to look at the branches that the current branch forks off from, and some regular expression matching to find one that looks like a Drupal development branch (i.e., 8.x-4.x, or 8.0.x). It's probably not perfect; I don't know if I accounted for a possibility such as 8.x-4.x branching off a 7.x-3.x which then has no further commits and so is also reachable from the feature branch. The other thing this script can do is create a tests-only patch. These are useful, and generally advisable on drupal.org issues, to demonstrate that the test not only checks for the correct behaviour, but also fails for the problem that's being fixed. The script assumes that you have two branches: the one you're on, 1234-brief-description, and also one called 1234-tests, which contains only commits that change tests. Go back to 1234-brief-description and do: git merge 1234-tests, so the feature branch includes the tests. Next step will be having the script make an interdiff file, which is a task I find particularly fiddly. There's been a lot of discussion about how we need github-like features on d.org. Will we get them? There's definitely many improvements in the pipeline to the way our issue queues work. Whether we actually need to replicate github is another debate (and my take on it is that I don't think we do). In the meantime, I think that it's possible to have a good collaborative workflow with what we have right now on drupal.org, with just the issue queue and patches, and git local branches. Here's what I've gradually refined over the years. It's fast, it helps you keep track of things, and it makes the most of git's strengths. Git's killer feature, in my opinion, is local branches. Local branches allow you to keep work on different issues separate, and they allow you to experiment and backtrack. To get the most out of git, you should be making small, frequent commits. Whenever I do a presentation on git, I ask for a show of hands of who's ever had to bounce on CMD-Z in their text editor because they broke something that was working five minutes ago. Commit often, and never have that problem again: my rule of thumb is to commit any time that your work has reached a state where if subsequent changes broke it, you'd be dismayed to lose it. This gets the current branch (e.g. 7.x, 7.x-2.x) up to date. Then it's a good idea to reload your site and check it's all okay. If you've not worked on core or the contrib project in question in a while, then you might need to run update.php, in case new commits have added updates. I like to prefix my branch name with the issue number, so I can always find the issue for a branch, and find my work in progress for an issue. A description after that is nice, and as git has bash autocompletion for branch names, it doesn't get in the way. Using the issue number also means that it's easy to see later on which branches I can delete to unclutter my local git checkout: if the issue has been fixed, the branch can be deleted! // Commented-out earlier approach that didn't quite work right. // Badly-formatted code that will need to be cleaned up. Core (or the module you're working on) doesn't stay still. By the time you're ready to make a patch, it's likely that there'll be new commits on the main development branch (with core it's almost certain). And before you're ready, there may be commits that affect your ongoing work in some way: API changes, bug fixes that you no longer need to work around, and so on. where BRANCH is the main development branch that is being committed to on drupal.org, such as 8.0.x, 7.x-2.x-dev, and so on. There's lots to read about rebasing elsewhere on the web, and some will say that rebasing is a terrible thing. It's not, when used correctly. It can cause merge conflicts, it's true. But here's another place where small, regular commits help you: small commits mean small conflicts, that shouldn't be too hard to resolve. Again, I use the issue number in the name of the patch. Tastes differ on this. I like the issue number to come first. This means it's easy to use autocomplete, and all patches are grouped together in my file manager and the sidebar of my text editor. git commit -m "joachim's patch at comment #1"
Alice can now make further commits in her local branch, and when she's happy with her work, make a patch the same way I did. She can also make an interdiff very easily, by doing a git diff against the commit that represents my patch. All simple so far. But now suppose I want to fix something else (patches can often bounce around like this, as it's great to have someone else to spot your mistakes and to take turns with). My branch looks like it did at my patch. Alice's patch is against the main branch (for the purposes of this example, 7.x-1.x). Note the dot at the end. This is the filename parameter to the checkout command, which tells git that rather than switch branches, you want to checkout just the given file(s) while staying on your current branch. And that the filename is a dot means we're doing that for the entire project. The branch remains unchanged, but all the files from 7.x-1.x are checked out. git commit -m "Alice's patch at comment #2"
I can make more changes, then do a diff as before, post a patch, and work on the issue advances to another iteration. 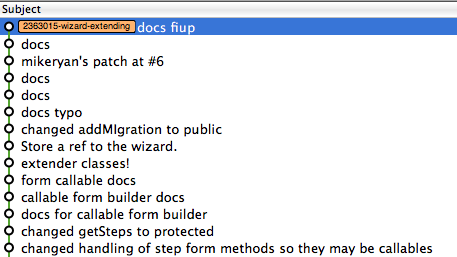 Here's an example of my local branch for an issue on Migrate I've been working on recently. You can see where I made a bunch of commits to clean up the documentation to get ready to make a patch. Following that is a commit for the patch the module maintainer posted in response to mine. And following that are a few further tweaks that I made on top of the maintainer's patch, which I then of course posted as another patch. Beyond that, I wonder if any changes can be made to the way git works on d.org. A sandbox per issue would replace the passing around of patch files: you'd still have your local branch, and merge in and push instead of posting a patch. But would we have one single branch for the issue's development, which then runs the risk of commit clashes, or start a new branch each time someone wants to share something, which adds complexity to merging? And finally, sandboxes with public branches mean that rebasing against the main project's development can't be done (or at least, not without everyone know how to handle the consequences). The alternative would be merging in, which isn't perfect either. The key thing, for me, is to preserve (and improve) the way that so often on d.org, issues are not worked on by just one person. They're a ball that we take turns pushing forward (snowball, Sisyphean rock, take your pick depending on the issue!). That's our real strength as a community, and whatever changes we make to our toolset have to be made with the goal of supporting that. My workflow for making patches is to use a feature branch for a single issue. Whether you're a contributor or a maintainer it lets you advance the fixing of the problem in small increments, and safely experiment knowing you can roll back. But where it goes wrong is when your patch is superseded by a newer one in the issue queue, and you want to work on it some more. How do you update your branch for the ongoing work? As ever, with git there's a way. Let's start with the basics first: you're making a feature branch to work on an issue. I tend to follow the naming pattern '123456-fix-all-the-bugs', but for this example I'll call it 'issue'. // Make a new branch and switch to it. // Make lots of commits. * [issue] Last commit, ready to roll a patch! Now someone else comes along to the issue queue, reviews your patch, and posts a new patch of their own. You in turn look at patch 2, and while it's an improvement, you think it needs still more work. The problem is how to apply the patch to your repository. It won't apply to the tip of the issue branch, and if you checkout master, you can't get back to your issue branch. You can of course just discard your original issue branch, and create a branch issue2 for patch 2. // Start on the issue branch. // Stash any work in progress! $ git checkout master -- . // actually look like master). // Now apply the new patch. // Now commit this as patch 2. // Remember to stash pop when you're done! * [issue] Applied patch 2 from Ada Lovelace. * Last commit, ready to roll a patch! Result: you can now do more work on this branch, and make more commits, and when you're ready, diff against master to make patch-3, ready to upload to the issue queue.